Broken Windows boarded and secured. We aim to respond within one hour. Whether it’s burglary, vandalism or bad weather, discovering your property has been damaged can be stressful and traumatic. Your main concern will be to ensure that your home or business is secure and safe, and this may require the help of an emergency glass repair and boarding service. Making sure you choose the right firm to provide this service is essential – after all you are placing the security of your business in our hands. When making your choice, four considerations are key – speed, reliability, quality and cost. A burglar, vandal or terrible storm can strike at any time of the day or night, leaving your commercial property vulnerable. In order to secure your property as quickly as possible – you will need an emergency service that not only provides a swift and fast local response but also is available 24 hours a day, seven days a week. The reliability of the service provided is critical – are you sure the firm can meet your needs? Looking for a firm who can guarantee to board any window or door by having access to the right equipment and boards is key. It’s also beneficial if a firm can ensure availability to all types of glass in the case of broken windows. A high-quality service is vital, if your premises are to be secured. For example, the use of high-quality plywood for boards is crucial to prevent trespassers gaining access to your premises. In addition, if you have a broken window having an expert glass fitter replace your pane will ensure the quality of the window fitted. For added piece of mind, look for companies that have been police approved and are fully insured. A final thought involves cost – in the midst of an emergency, you may not have access to funds to immediately cover the cost of boarding or glass replacement, and waiting until you do may delay the security of your premises. In this case, it is useful if your insurance company can be directly billed, allowing work to commence without delay. Additionally, look for firms that do not charge a callout fee and will provide you with a free quotation – this will prevent you being charged, should you decide not to take up a service once quoted. If you are unfortunate enough to need an emergency boarding and glazing service, contact Britannia Glazing. Available 24 hours a day, seven days a week with a guaranteed response time of less than an hour, they always deliver a high quality and reliable service. Whether you need a police officer, the fire brigade or an ambulance, you know that in the face of an emergency you should always dial 999. Emergency boarding-up services are quite different however, with many of us not considering the importance of knowing who to call until the worst has happened. Don’t wait until it’s too late – find out today why emergency boarding-up services may one day prove crucial to you, your home and your business. Being burgled is a horrible experience, and your main concern will often be to re-secure your property. Unfortunately, this will involve fixing broken windows and doors that thieves have used to access your home or business. As it may take some time to replace either your doors or windows permanently, knowing a fast, efficient emergency boarding-up service to secure your property temporarily is essential. In the last decade, floods have become a more common occurrence in the UK, with heavy rains, storms and burst riverbanks resulting in billions of pounds of damage. In the aftermath of a flood, contacting an emergency boarding-up service as soon as possible is crucial. Emergency boarding will not only help to secure your damaged property but, critically, it will also prevent further weather damage to your home or business. Whether it is your family home or your business premises, fire can cause serious structural damage to your property, as well as leaving it at high risk from further damage as a result of theft, vandalism or the elements. Depending on the severity of the fire, knowing a company who will attend your premises promptly to secure it will help to prevent any further heartache. Not only will they secure your property and personal effects from further loss or damage but, in serious cases where your property may be condemned, they will also board up your property to prevent unsafe entry. Whilst tornados are thankfully rare in the United Kingdom, hurricane-force winds and heavy storms are not – with both leaving a trail of damage in their wake. If your home or business has been damaged by a storm, you’ll need to enlist the help of an emergency boarding-up service. 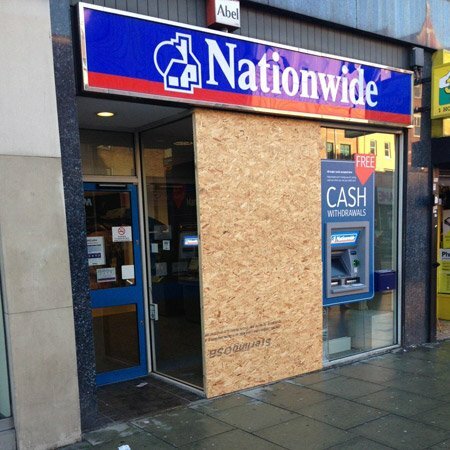 Any broken windows, broken doors or holes in the roof will need to be securely boarded up in order to secure your property and protect it from any further loss or damage. Nobody likes to think of the worst happening, but when disaster strikes contacting an emergency boarding-up service is crucial. At Britannia Glazing, we are specialists in boarding-up services. With a service that is fast, reliable and trustworthy, you can rely upon us when you need us the most.